The end of Summer Heat. Time to strengthen the blockade! March has arrived and our 350.org Summer Heat campaign comes to a close. What an amazing three months it was. You helped support over 100 events targeting the fossil fuel industry, thousands of you took part in actions across the country and showed that we are a strong and united movement. But our work does not stop as the summer heat subsides – 2014 is a crucial year to stand up to the dangerous expansion plans of the coal and gas industry and their backers in Government. As you probably know, the community blockade to stop the Maules Creek Coal Mine has become a flagship fight for 2014. Already we’ve seen 350.org Australia supporters from across the country turning out to info nights, undertaking non-violent direct action trainings and heading to the blockade to lend a hand. The show of support has been inspiring – but it’s time to do more. If there is any chance of stopping this coal mine, then the blockade needs to stay strong and grow. To build this strength, we need your help. A conversation with a friend or family member is one of the most powerful ways to inspire people to take action. 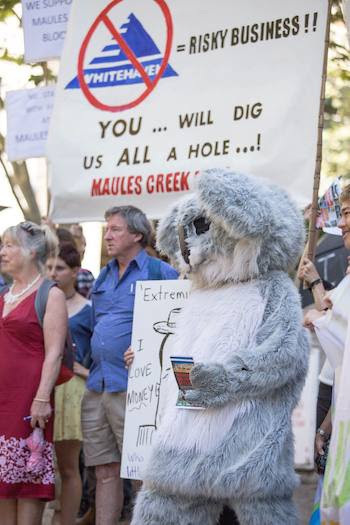 With your help we can inspire thousands across the country to join the Maules Creek Campaign. That’s why we are inviting you to run a Do it Yourself – Maules Creek Info Night or Fundraiser. These events can be run from the comfort of your own living room, over a barbeque, at the local community hall – anywhere really. Sign up today and we will get in touch with the resources you’ll need to start planning. 350.org Maules Trip – from the 16-19 March our team is heading to the blockade – come and join us, the more the merrier! Act Up 3 – from 29th March – 1 April hundreds will gather for training and collective actions. Register to join one of these trips or to travel up at another time – we’ll get in touch to plan transport. The fight to stop the Maules Creek Coal Mine will be long and it will be hard. But with your help we can build the strength of our movement and stand up for a safe climate! P.S. If you can’t get to Maules Creek, or don’t have time to organize a fundraiser, consider making a donation to support our efforts. Donate here. 350.org is building a global climate movement. Connect with us on Facebook and Twitter, and sign up for email alerts. You can help power our work by making a donation. To change your email address or update your contact info, click here.